Les passed peacefully at Carman Memorial Hospital at the age of 92 on Aug. 28, 2017. Les was predeceased by Phyllis, his wife of 65 years, in 2013 and his grandson Christopher. He is survived by four children: son Neil and Diane, Jane and Finn, son Keith and Catherine, Andrew and Ben, daughter Heather and Bill, Evan and Keiran, daughter Robin and Robert, Michael and Krista, his two great-granddaughters Alice and Audrey and his sister Joyce Conquist. Les was an RCAF WWII veteran serving in England, Belgium, Denmark and Germany. Postwar he joined the Wpg Rifles Band while taking his Agriculture Diploma at U of M.
He then farmed the land that his family homesteaded in 1879, moving on to piano tuning and restoration. Les & Phyll shared a life long love of music that they passed on to their children and grandchildren. He played cornet in dance and community bands including the Prairie Red Coats. 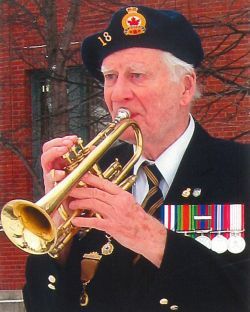 Being a Legion member/horn player, he played Last Post at 68 Remembrance Day Services in Carman, and for over 600 veterans' funerals. Les's lifelong passion was to commemorate the Air Force. In 1978, after 8 years of research, he published "Canadians in the Royal Air Force". In 1992, his 10 years of research for the Brandon Commonwealth Air Museum ended with their publication of "They Shall Grow Not Old". In 2002 he was a contributor to "Geographical Names of Manitoba" and "A Place of Honour". He was awarded the Queen's Diamond Jubilee Medal. A Celebration of Life will be held Friday Sept. 22 at the Roland United Church at 2:00 pm. My condolences on the passing of your father. He was a great guy. My thoughts are with you , Neil, Keith, Robin and Allison and families. Our condolences to your family on the loss of your Father. I know you shared many great memories together as we enjoyed hearing of your musical accomplishments , and war memorial accomplishments , when you shared the stories at work. Sincere condolences on the passing of your father. Your Mom and Dad were great friends of my parents. His contribution to the Legion, the community and as an historian is unparalleled. He will be sadly missed but fondly remembered. My sincere and deepest sympathy to all of you on the passing of your dear Dad , Grandpa & Great Grandpa.